Artists and Academics are a famously peripatetic bunch, often wandering the nation like vagabonds for various causes, washing up in unexpected places like so much flotsam and jetsam in a Tom Hanks movie. And so it was, like many before that I found myself in the Fall of 2010 wandering the unknown lands of an uncharted territory that I knew only as “South Florida”. After I gained my bearings and found a reliable source of fresh water, I was able to determine that this was in fact the southern edge of a very large peninsula that connected to the mainland at an unknown point north. The local inhabitants were pleasant people, and after relaying to them my peculiar interests they gave me directions to several cultural destinations that I might fancy. It was here, at the many gatherings and galleries that loosely define what one might call an “art-scene” that I began my investigation in greater depth. Finally, after two and a half years of inquiry and methodical study I have created the following curatorial effort to document my findings. The artists in this exhibition are but a few of the many talented and dynamic individuals working today in South Florida, but their art spoke to me in a very direct way. All curators bring with them a sensibility, a vision of the world that frames and categorizes the overflowing efflorescence of creativity that one might dip a hand into in order to pull forth one thing over another for further consideration, and I am no exception. 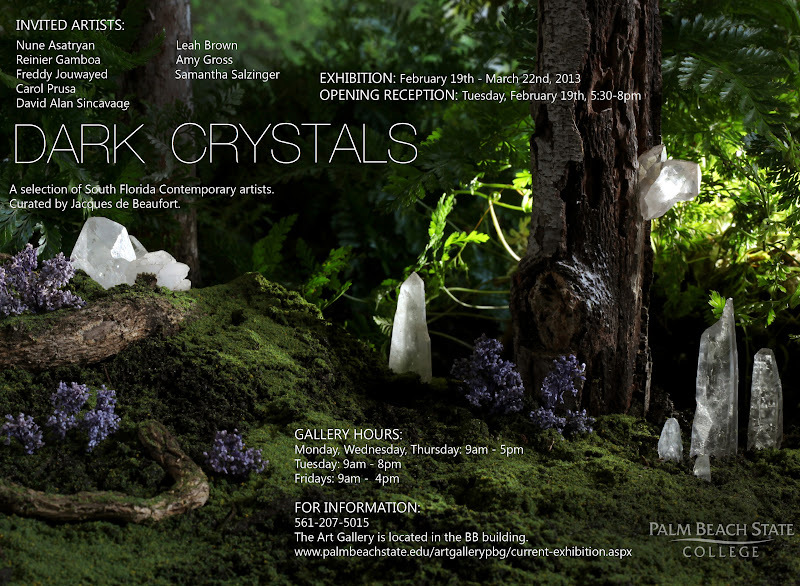 I like to think of this particular taxonomy, this exhibition, as a gemological display of Dark Crystals that are native to this region. Firstly, I find in their work something mysterious and indefinable- a “darkness” that is not necessarily the darkness of death and decay, but more the penumbra of things unknown or imagined. At various times and in various instances I have thought of qualifying adjectives such as phantasm, visionary, mystic, imaginal, but I must admit there is no cudgel of descriptive clarity that would simplify and reduce the complexities of this x-factor into something suitable for a sound-bite or byline because the work remains multifarious and diverse. In this post-historical nether region that we have found ourselves inhabiting there no longer seem to be transcendental movements that permit the unification of artists into simplistic epistemological corrals like so many cattle into the Critical meat-grinder. On the contrary, each artist remains a universe unto themselves, a complete and fully functional idiosyncratic cosmology in which parts and pieces of the Universal have been lovingly crafted into something so specific it cannot be shared by language. The thread that guides us out of this labyrinth is only the path charted by my curatorial eye, which is to say a subjectivity that like the crystals in question, and the far-side of the moon, remains Dark, because it is knowable only in the abstract. Similarly they possess a radiance and beauty that qualifies them as “Crystals”. Something magic perhaps as well, and like the molecular lattices of mineral samples, they vibrate with their own internal logic. What cannot be denied is that the works in question are indeed in possession of this vibrational energy, and though one may view such phenomenon with the haggard lens of scientific materialism, reducing all events into mere quantitative datum, ultimately the sensations of experience are to be felt and not measured. In this way these Dark Crystals are in possession of a certain quality that can be ascertained only through direct observation. And so like a collector of beautiful shells, or more ominously of dried and mounted insects, I present to you a display of local talent. Each artist glimmers and shines with their own vintage aura, and like the facets in a great majestic diadem, here in this exhibition they form a type of unity. It has truly been a pleasure wandering in the wilderness and discovering these creators. I hope you will find in their work the same glittering magic that caught my eye as I surveyed the landscape, and that your experience of life will be made more vivid in some small way. How many people can fit into a Volkswagen? How do you squeeze so much into one day? I can barely eat breakfast before it becomes time to eat supper. Looking forward to the show..thanks for everything you do! I'm gone to inform my little brother, that he should also go to see this weblog on regular basis to take updated from latest information. are in check off of your valuable adjust in motion circumstance. What's up mates, how is everything, and what you want to say about this piece of writing, in my view its truly awesome for me. needed. I so much for sure will make certain to don?